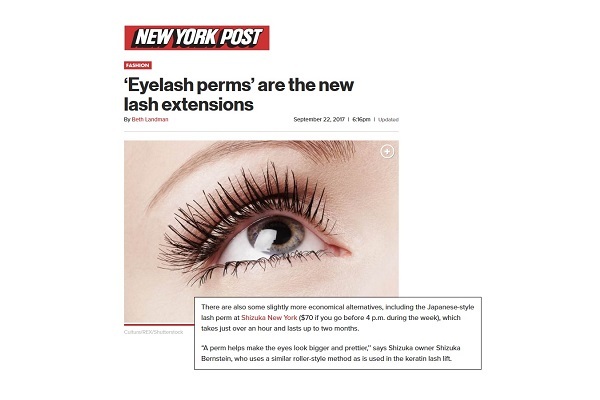 Shizuka New York Day Spa’s The Geisha Facial® and Eyelash Perm treatments were mentioned in The Associated Press article, “Holiday Gift Ideas for Your 1 Percenters”! There’s always the Geisha “bird poop” facial for $180 at the Shizuka NY spa in Manhattan. Throw in an eyelash perm. Top lashes only: $90. Add the bottom lashes for an extra $30. Shizuka New York Spa Gift Certificates make the perfect gift for everyone on your holiday list! Besides opening up the look of your eye, lashes actually serve a function to protect the eyes, keeping them free from foreign agents and debris. Regular lash care keeps them healthy and strong while making your eyes “pop”! 1. Rub eyes delicately if you really have to. Lash roots are extremely delicate so any scratching or rubbing can actually weaken lashes causing them to break. 2. Stay away from lash roots when using an eyelash curler. You know you’ve gone too far when you pinch or tug the eyelid. 3. Remove all mascara gently with make-up remover before going to sleep. 4. Comb through lashes to remove clumps of mascara as soon as it’s applied and don’t tug lashes. If the mascara has already dried a bit, apply a bit of make-up remover to the comb until the clumps are removed and lashes separate. 5. Throw away old mascara. It’s ideal to renew your mascara every 6 months. The likelihood for germs and bacteria increases the longer you keep it. 6. Replace any eye makeup used during an eye infection, including pink eye. 7. Condition lashes regularly. Just like your hair, lashes need to be conditioned as well. You can purchase eyelash conditioners over-the-counter that will help fortify and moisturize your lashes. Conditioners are especially recommended between any chemical treatments like eyelash perms. Other alternatives for longer lashes include: eyelash extensions, Revitalash, or the prescription drug Latisse. SNY Makes Manhattan Magazine’s Best of the City List! Our eyelash extension treatment is featured in the January/February issue of Manhattan Magazine’s “Best of the City” list! At this spa, silk lashes are delicately and meticulously applied one by one, making eyes look bigger and more feminine; the look even lasts through swimming. You’ll never need to apply mascara again! For brides-to-be, Shizuka recommends trying our Eyelash Perm at least two months before your wedding to make sure you like the look. You can then come back 1-2 weeks before the ceremony to have perfectly curled lashes on the big day. Shizuka New York Day Spa also offers Eyelash Extensions, Eyelash Tinting and spa packages such as our Hanayome Bridal Spa Package (4 hours, $350). To make an appointment for any of our eyelash or bridal spa treatments, please use our online request form or call (212) 644-7400. Carlashes: Falsies for your Ford? This BMW is ready for her(?) close-up. Find more information about eyelash treatments for people here. Beautiful Claire Danes is the latest celebrity to endorse Latisse, an exciting eyelash treatment that grows inadequate lashes in just 16 weeks. Claire joins fellow actress Brooke Shields who also saw significant growth in her lashes from Latisse. In New York City, Latisse is available only with prescription and behind the counter at your local pharmacy. Shizuka New York Day Spa’s Dr. Robert Silich provides Latisse consultations in our relaxing spa environment conveniently located in Midtown Manhattan near Rockefeller Center. Learn more about Latisse, including instructions on how to apply the Latisse solution here. View Claire Danes’s full gallery of Latisse before and after photos here.